Please laminate your signs. It will encourage people to read your signs. Please sign your signs. It will sign to people that your signs sign signs. Yeah, I know I’m late to this one…sorry. This makes me hate college more than I already did. So . . . How does simply leaving a pan in the drying rack lead to it getting gross? Unless all their fry(ing) pans are cast iron, I don’t know. I wondered the same thing. But “overflowed” or “piled up” is different than “gross” in my opinion. Gross is slimy. Did you hear that “whoosh”? That was the sound of a joke going RIGHT over my head. I am supposing that letting them in the drying rack and not putting them away results in the next person splashing dirty dish water onto them. But perhaps #4.2 is right too. Maybe it’s because if the pans are always there no one is cleaning the draining board and that’s what gets gross? Perhaps not only the hanging up is being shirked, but the washing as well. HA! My exbf went to MIT, he will love this entry. My favorite is the non-French-speaking person’s version of French on the multilingual sign on the right! Le please le write le signs en le variety of le languages so le more people can le understand them! I hear that in Pepe Le Pew’s voice. Le mine too, Red. Le mine too. The Spanish is a bit off, but not as much as the pseudo-French. I’m puzzled by the underline under the second period of the big sign, with the “why?” comment. Uh, because it’s good grammar? I know y’all are more number crunchers than English whizzes, but periods should not be a mystery. It may be good grammar but it’s not PA enough. Clearly the “why” person is asking why there isn’t an exclamation point there (or 2 or 3 or 6435). The multiple “languages” on the sign on the right side is hilarious. Are you serious? 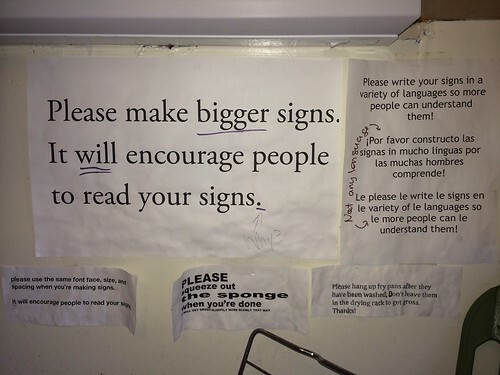 The words ‘bigger’ and ‘will’ were underlined by the signs creator to accentuate the message of the sign. I believe the ‘why’ under the underlined period is basically asking “how does the period accentuate the overall message being conveyed?” But that’s just a common sense approach, as opposed to assuming a period is a mystery to someone who attends MIT. If the underlines come from the sign’s creator, why do it in pen? Why not use the underline function of whatever word processor they used? This strikes me as an addition by another hand. It also could be a code: WILL BIGGER PERIOD. No thanks. 4 days is enough for me. Elf, my thought would be someone printed out the sign, stuck it up, stood back to admire their work and then decided that there wasn’t ENOUGH EMPHASIS!!! But were then too lazy to actually print out another one. B vitamins will cut it down significantly and make you feel better. Dissolve in a glass of water and drink first thing in the morning before ingesting anything else. A sponge shouldn’t be too difficult to please considering how many holes it has. You just have to find something small enough to shove in them. Poltergeist, I know a guy. They should reconsider proper usage of large font on particular words because all I want to do now is please the sponge. Better than me then, I saw sponge and automatically thought Spongebob. I have a six-year-old niece, in my defense. At least MIT students have the discretion to not use Comic Sans, put hearts and stars on them, or use clip art. Bless you, MIT students.